Access from Vail : Exit I-70 at Vail exit 176 and take the North Frontage Road west to Red Sandstone Road. Turn right and follow to the winter road closure gate and park here. Attractions/Considerations : Due to past timber sales, this trail offers many excellent open areas suitable for cross-country skiing. Excellent views of the Gore and Sawatch Ranges are abundant. Snowmobiles may be encountered on the first 1.5 miles of road due to a commercial snowmobile guide service that is located on Red Sandston Road. Road, three more junctions are encountered. The left fork should be taken in each case as the trail follows Lost Lake Road for 4 miles to the trailhead for the Lost Lake Trail. 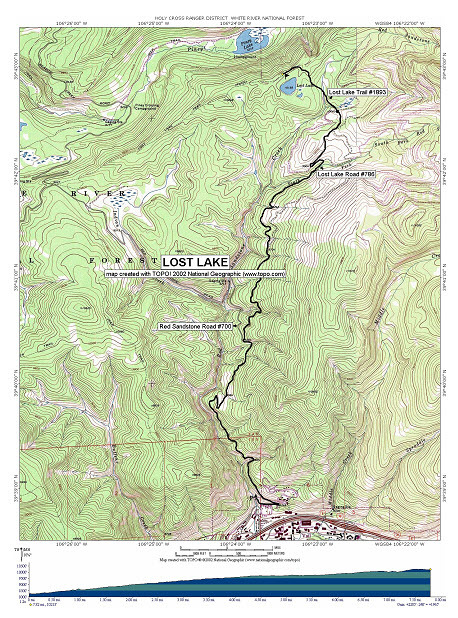 One more mile, and the trail ends at Lost Lake. Lost Lake is a popular place to hike or drive to in the summer. However, due to its distance from the parking area (15 miles round trip) it receives less use in the winter and is suggested for skiers in good physical condition.